The process of upgrading your lighting and controls system can be an overwhelming task — especially if your contractor isn’t well versed in the various options and technologies. Even the smallest miscalculation during an audit can become incredibly costly. We recognize this frustration, which is why we’re now offering a new Project Development Assistance service. This new consulting service was recently used by a Boston school district to create a customized LED retrofit kit for their high school. 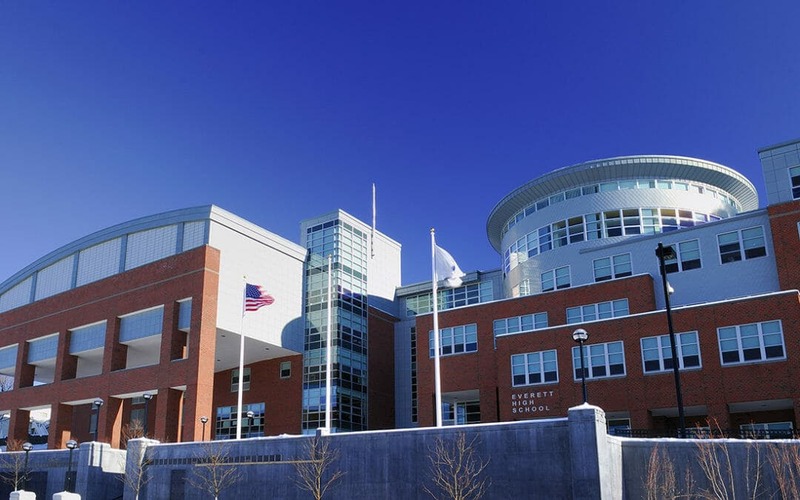 Everett High School was built in 2007, and the five-story building is the largest high school in the Boston area. A few years ago, the Everett Unified School District received funds to be used for building upgrades to Everett High School. Though the lighting system in the building was still in decent condition, the district decided it was time to update the bulbs from fluorescents to LEDs, an obvious move considering the energy savings and longevity of LED bulbs. Understandably, the district did not want to remove the high-end direct/indirect pendant fixtures in the building because they were less than 10 years old and in good condition. In looking for an LED retrofit kit, however, the district’s contractors realized that there wasn’t an existing kit on the market that was a viable option. So, the contractors reached out to FSC to see if we could come up with a solution. The Everett High School contractors decided to take advantage of our new Project Development Assistance service. This new offering pairs clients with a consultant who conducts your audit and assists with your order, taking some of the burden off your shoulders. Throughout the project, the consultant acts as a second set of eyes, so when our clients place an order, they can rest assured knowing they’ve made the right investment. After analyzing the existing lighting fixtures at Everett High School, our rep was able to mock up a custom LED retrofit kit, and the drawings were sent over to the contractors at Everett High School for approval. The new lighting plan called for a replacement of the linear T8 fluorescent fixtures with FSC’s 28-watt L-BAR Strip throughout the school. The proposed solution would not only allow for a controls system to be put in place, but it would slash energy usage — and costs — by 50%. Once the plan was approved, FSC worked with the district contractors to ensure the project moved along smoothly. Through the Project Development Assistance service, our consultant verified the accuracy of the district’s lighting order, signed off on samples and prototypes, and coordinated all deliverables and timing to ensure the project goals were met. As predicted, the new system slashed the operating costs of the entire campus by roughly 50% once it was installed. But that wasn’t the only benefit. The new lighting system also improved the learning environment by doubling the minimum light level allowed and creating more uniform illumination and color consistency across all classrooms. duplicate the kit for every school in the district, which we swiftly did. Without the customization provided by the Project Development Assistance service, this project would not have been possible. The school would have had to pay enormous amounts of money to install completely new light fixtures in order to make the LED upgrade happen. To learn more about the Everett High School project, download the case study. If you need help tackling an upcoming lighting or controls project, be sure to check out our new Project Development Assistance service or contact us to find out how we can help make your next lighting project a success.